How Important is it to Have Subscriber Permission? Permission to send emails from your subscribers are important! The first step to build a successful list is to get permission from subscribers who want to receive your email campaigns. Permission is not only common courtesy, it's required by our Acceptable Use Policy. Permission has a very specific definition when it comes to email marketing. Permission is express, verifiable consent to receive marketing communication. Express means that when you asked for permission, your question wasn't tied in with another agreement. For example, a separate checkbox for "I would like to receive marketing email from X company" is express and clear. Your permissions should also be verifiable and we recommend you archive your permission from each subscriber. In addition, we track and save the date and time of submissions, in LimeSpot’s Approach signup forms, to make sure you’ve verified permission. It’s more likely to receive spam reports and complaints from people who haven’t given your permission and less likely to engage with your email marketing campaigns and/or make purchases. 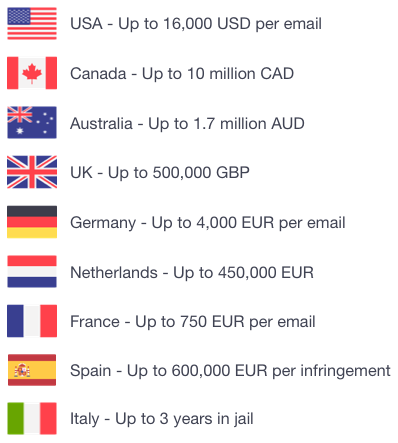 Many countries have legislation around what types of marketing emails you’re permitted to send and require expressed or implied consent before sending an email. These laws have serious penalties if you don’t meet the requirements. Many of these laws don't only apply to the senders location, they also apply where the customer is based. For instance, Canada's Anti Spam Law (CASL) applies to senders based in Canada, as well as all companies who are sending to Canadian citizens. Want to learn what's required to protect yourself? Check out our article on anti-spam requirements.